Hayley Stevens, former chef and instructor at the International Culinary Center, will be speaking on tasting extra virgin olive oil at the Olive Oil Conference in the Chicago area on July 19, 2016. Hayley was also the winner at the first North American Extra Virgin Olive Oil Taster's Championship at the Olive Oil Conference last year. Hayley Stevens has extensive cooking experience from Italy. She graduated from the Corso Superiore at the famous Italian culinary school, Alma, in Parma, Italy. She's worked under the tutelage of top chefs in Italy including Alessandro Breda and Pino Cuttaia. Hayley has also worked as a chef at the Michelin-starred restaurant Don Alfonso for many years, using ingredients found in the Mediterranean Sea and the Vesuvian land. Lastly, she was an instructor at the International Culinary Center where she taught for their Italian and French culinary programs. In addition to her experience as a chef using olive oil, Hayley has traveled throughout Europe to learn about olive oil and wine. Today, she resides in Saratoga Springs, NY, where she leads classes on how to cook with extra virgin olive oil as well as managing Saratoga Olive Oil Company. 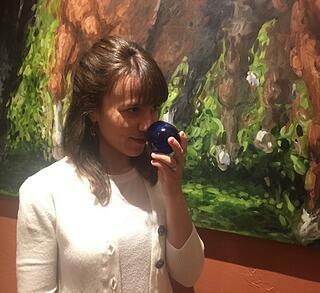 Attendees of the upcoming Olive Oil Conference will have a chance to meet Hayley Stevens who will conduct demonstrations on tasting of extra virgin olive oils from around the world on July 19th.